I don’t know about you, but nearly every day as I’m checking out the latest health news, I see countless articles about the benefits of apple cider vinegar. So much so that it appears to be nature’s magic potion. But, is this true? By looking at that list, you’d really wonder if you ever needed to do anything other than drink doses of apple cider vinegar to live a healthy life! But unfortunately, according to notable nutritionist Leslie Beck, there isn’t much meat to many of these claims. And, the ones that do have some backing are overhyped to the utmost degree. So, it’s no magic potion. But, don’t lose hope when it comes to the health benefits of apple cider vinegar. It does appear that apple cider vinegar may be useful to people with prediabetes—a condition where individuals often have above-average blood sugar, but not to the level of full-blown diabetes. However, many people with this condition will eventually develop diabetes. But apple cider vinegar may offer some benefits to these people, before it gets to that point. A 2004 study conducted by researchers at Arizona State University found that consuming about four teaspoons of apple cider vinegar directly before a starchy meal can reduce the post-meal boost in blood sugar. A starchy meal would be one that contains potatoes, pasta, or bread. It should be noted, however, that although the researchers tested apple cider vinegar on both prediabetics and people with type 2 diabetes, only those with prediabetes experienced significant reductions in post-meal blood sugar. 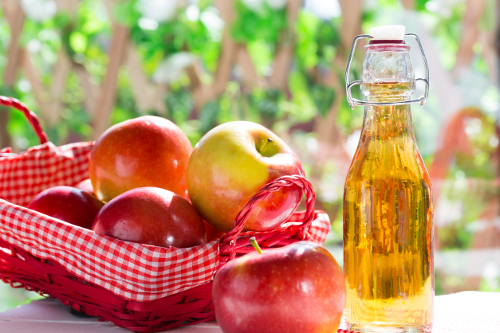 It appears that apple cider vinegar can improve how the body uses insulin, and it’s likely tied to the acetic acid found in vinegar—not just the apple cider variety. Acetic acid may slow the digestion of starches, preventing some from being absorbed into the bloodstream. And, because acetic acid is present in more palatable vinegars like balsamic, you can likely get the same benefit by using some balsamic vinegar on a salad before eating the starchy portion of your meal. Don’t drink it straight. Dilute it with water to reduce the risk of throat and esophageal irritation, as well as increased stomach acidity. Only use it for a limited time. Long-term use can result in severely low potassium levels, which can put your heart health at risk. Johnson, C.S., et al., “Vinegar improves insulin sensitivity to a high-carbohydrate meal in subjects with insulin resistance or type 2 diabetes,” Diabetes Care, January 2004; 27(1): 281-282. https://doi.org/10.2337/diacare.27.1.281. Beck, L., “Leslie Beck: Is apple cider vinegar a miracle health product?” The Globe and Mail, June 9, 2017; https://www.theglobeandmail.com/life/health-and-fitness/health/leslie-beck-is-apple-cider-vinegar-a-miracle-health-product/article35261372/, last accessed June 15, 2017.